Growth sustained by government investments in infrastructure and private consumption. For more than five decades Colombia’s state authority has been challenged by (drug-financed) guerrilla groups. However, at the end of 2015 the Colombian government and the main guerrilla group FARC reached an agreement to conclude a decisive peace accord. A final settlement is expected in March 2016, followed by the demobilisation of the FARC forces. This would be a milestone improvement of the country’s security situation. However, domestically the government is widely criticised due to some major concessions it made (e.g. that FARC leaders accused of war crimes would only face minor punishment after a final settlement). In 2015 Colombia’s GDP growth slowed down due to decreasing commodity prices (commodities like coal and oil account for 80% of Colombian exports, with oil alone accounting for more than 55%). That said, the slowdown is expected to be partly offset by government investments in infrastructure, a further improving business climate and a growing middle class. 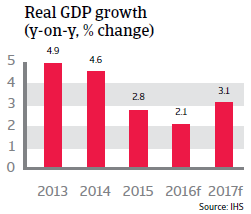 In 2016 and 2017 the economy is expected to grow 2.1% and 3.1% respectively. However, poverty and unemployment remain high. 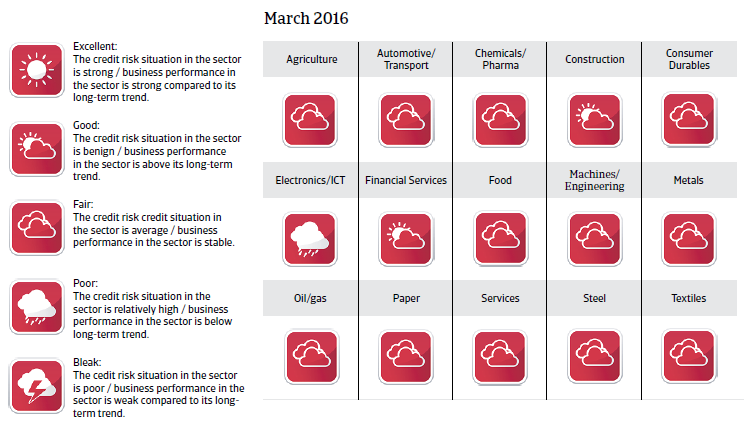 In recent years sound economic policies have contributed to higher earnings capacity and economic resilience. The fiscal deficit is widening due to lower oil revenues, but not to a very large extent, and while government debt is rising, sustainability is not at risk. Sound fiscal management has reduced exchange rate, refinancing and interest rate risks. Solid macroeconomic fundamentals and sound policy frameworks also indicate that Colombia is quite well positioned to deal with the challenge of continuously low commodity prices. The depreciation of the Colombian peso in response to tumbling commodity prices since 2014 has helped to absorb any potential economic shocks. Managed currency floating is supported by a limited dollarization of the economy and modest external debt (34% of GDP in 2015). The peso is expected to gradually weaken further in coming years. 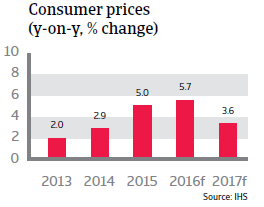 Inflation increased 5% in 2015, triggered by the currency depreciation. The Central Bank has repeatedly increased the benchmark interest rate to contain inflation since September 2015, to 6% in January 2016. That said, inflation is expected to increase further in 2016. 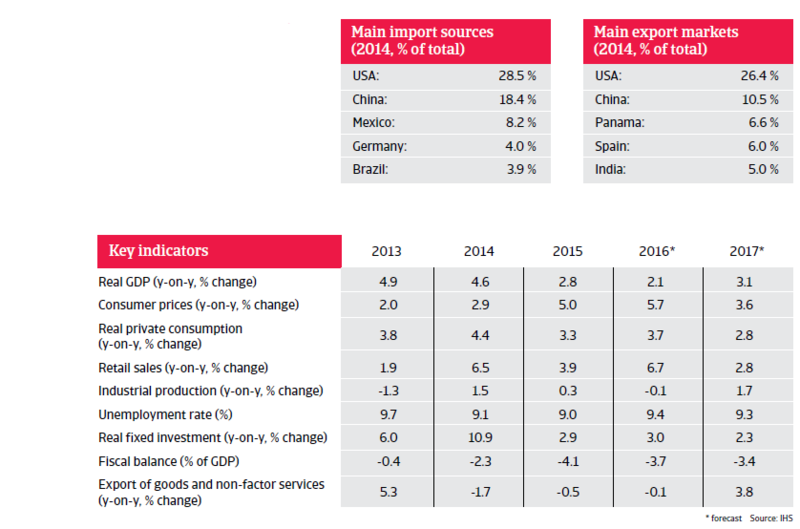 Colombia’s external economic position is solid. While foreign debt is increasing, also on the back of the currency depreciation, it remains modest. The international liquidity position is sound, with international reserves amounting to more than nine months of import cover, sufficient to cover the external financing requirement. Official reserves are underpinned by a precautionary IMF Flexible Credit Line of USD 5.8 billion. 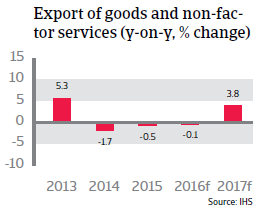 The current account deficit is expected to decrease only slightly in 2016, as the effect of the peso weakening will be largely offset by import demand. The deficit can be easily financed by capital inflows, especially foreign direct investments. Stable investment grade ratings and excellent payment records allow Colombia to easily access international capital markets. Despite significant economic progress, Colombia still has high rates of poverty and inequality, especially in rural areas. In order to achieve sustainable long-term economic growth, job growth promotion, social reforms and infrastructure improvement would be necessary.